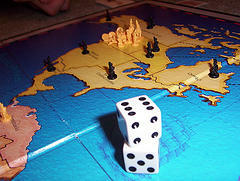 Risk is a war strategy game that allows players to compete against one another in attempting to take over the world. Since its introduction, Risk has gone through various changes, but has stayed mostly true to the original. Likewise there are several slight variations on the rules but all are very similar. Here we explain how to play Risk. To begin playing Risk, the board must be set up. Unlike most board games, set-up is a major part of this game and much of the strategy is in how a player sets up his/her pieces. Each player begins with a set number of pieces. For a two player game, each player gets 40 infantry, plus a neutral set of 40. For a three player game, each person starts with 35 infantry. Four players each get 30, five get 25, and six get 20. The game comes with six color sets, so unless people play in teams, there are usually not more than six players. Beginning with the player who rolled highest, or the youngest person (or some other predetermined order), each player takes turns placing one piece at a time in an unoccupied territory. Once all 42 territories are occupied, players continue taking turns adding one piece at a time to countries they already control. In the game each cavalry piece is equal to five infantry pieces and each cannon is equal to ten infantry pieces. After all the pieces have been set up and all the territories are occupied, play begins. Players should role a die to determine who will go first. Step 1: The player (whose turn it is) earns infantry pieces depending on the number of territories and continents they occupy. Count the number of territories that player controls and divide that number by 3 (round to the lower whole number). Players earn at least 3 pieces even if they have a low amount of controlled territories. If a player controls an entire continent, he/she earns additional pieces depending on the continent (look at the game board for the amount per continent). A player can also choose to trade in cards for pieces at the beginning of their turn. Once the earned amount is calculated, the player must distribute those pieces on territories he/she controls. in the attacking territory or more). The defending player may roll one or two white dice depending on how many armies they have in the occupied territory. Players with only one army in the territory being attacked can only roll one die. The players then roll the dice, the highest numbers winning. In case of a tie the defending player wins. For each die that rolls the lower number, the corresponding player must remove one army. For example if the attacking player rolls 5, 3, 2 and the defending player rolls Five, four, than the attacking player must remove two armies. If the attacking player rolls 5,5, 2 and the defending player rolls 4,4 than the defending player removes two armies. If the attacking player rolls 5,3,2 and the defending player rolls 4, 4 than each player must remove one army. After each round the attacking player can choose to attack again , attack somewhere else, or pass. If the attacking player wins the territory they then must move at least the number of armies they attacked with into the new territory and they must leave behind at least one infantry piece in their attacking territory. All territories must always have at least one army occupying them. If the attacking player wins a territory (or more than one) during their turn, they draw one card from the pile before passing the dice to the next player. Step 3: The final step in each turn is the fortifying of positions. The player (no matter what happened in their turn, even if there were no battles) can choose to move any amount of pieces from one territory to an adjacent territory that they already occupy. This can be done only once per turn and include no more territories than the one giving and the one receiving. Play continues in this fashion until one player has occupied all the territories.